Billionaire entrepreneur Richard Branson on Wednesday said he hoped a concert in Colombia aimed at raising money for crisis-wracked Venezuela would encourage the country's soldiers to defy orders from President Nicolas Maduro and let humanitarian aid cross the border. 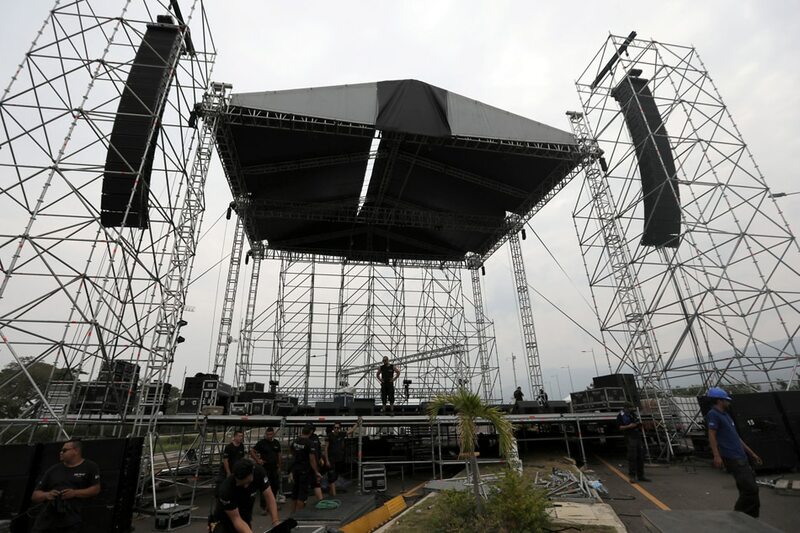 Some 250,000 people are expected at Friday's concert in the Colombian border town of Cucuta that organizers say will raise about $100 million to buy food and medicine for Venezuelans suffering widespread shortages. Branson, who is backing the show, dubbed "Venezuela Aid Live," told Reuters he expects money to flow in from many countries if the Tienditas Bridge crossing from Colombia to Venezuela can be opened. "I think that if we can persuade the soldiers to open the bridge, that's the ideal outcome from this concert," he said in an interview via satellite link from the Mojave Air and Space Port in California. "That will then mean that people who are dying from cancer because they're not getting the right pills, or other illnesses, they will be able to get help medical help." The United States and scores of other countries have openly backed Maduro's rival, opposition leader and congress chief Juan Guaido, who last month invoked constitutional provisions to declare himself interim president. The opposition plans to send aid into Venezuela on Saturday from collection points in neighboring countries including Colombia via sea and land, despite Maduro's refusal to let it in, setting up a possible clash with authorities. Maduro, who is facing growing international pressure to step down after his disputed re-election last year, denies there is a humanitarian crisis and has blocked the bridge leading from Colombia to prevent aid getting through. The presidents of Colombia and Chile have publicly said they will attend the free concert, which has evoked comparisons to Irish rock star Bob Geldof's 1985 global "Live Aid" concert to raise money for famine relief in Ethiopia. Two other world leaders may attend, organizer Fernan Ocampo told reporters in Cucuta earlier on Wednesday, without naming them. "We've got quite a few presidents from South America coming to the concert who have pledged to put a considerable amount of supplies into Venezuela once we can get the bridges opened," he said. While still unclear how the aid will get across the border, Branson said 1 million people are expected on the Venezuelan side of the bridge, led by Guaido, to distribute the aid. Branson also responded to comments made on Tuesday by Pink Floyd co-founder Roger Waters, who criticized the concert as a US-backed effort to tarnish Maduro's socialist government, saying there was “no mayhem, no murder, no apparent dictatorship” in Venezuela. "I don't think that Roger Waters is the best expert when it comes to what's going on in Venezuela. He says that it's a democracy, people are not suffering, and it's just not true," Branson said. "Anybody who knows anything about Venezuela should know that that is a load of a rubbish and Venezuelans need help." Donations to the event will be received online and via direct deposits. Hundreds of tons of humanitarian aid from the United States and other countries are being stored in warehouses in Cucuta. Maduro is planning rival concerts on the Venezuelan side of the border on Friday, and the Venezuelan government says it will distribute aid to poor Colombians.